What makes it special? Housed in individual pavilions is the living area with en suite bathroom, a dining sala, the Spa treatment room and the master bedroom adjacent to an en suite bathroom offering handmade bathtub and steam shower. Built at the waters edge on the rock formations of a private bay, this stunning cluster of Pavilions face west to the setting sun and represent the last frontier in pampered luxury. Your privacy is assured as access to the Villa is via a series of wooden walkways set into the mountainside, a scenically breathtaking twenty minute walk from our main restaurant and bar. This area is only accessible to the presidential villa residents. Beside the in-Villa spa treatment room, the private infinity plunge pool blends naturally with the horizon and surrounding boulders. Housed in individual pavilions is the living area with en-suite bathroom, a dining sala, the Spa treatment room and the master bedroom adjacent to an en-suite bathroom offering handmade bathtub and steam shower. A dedicated butler is on call 24 hours a day to cater to your every need, residing in the adjoining butler unit. Wow. You find some of the coolest resorts. Why do I never find these kinds of places? Oh wait, because they are thousands of dollars beyond my budget! Great find, keep up the good work! Hi Daved… good of you to drop by again. Of course, this is the Presidential Villa so it commands a higher price tag than most of us can justify. The resort’s rates start from $667 per a night for a Beach Pool Villa. Not so bad when you consider that those villas come with their own garden and plunge pool, as well as direct access to the beach. They also run a number of special offers and packages throughout the year. spectacular looking hotel will definitely be on my list to visit. wow! Thanks so much for the post. 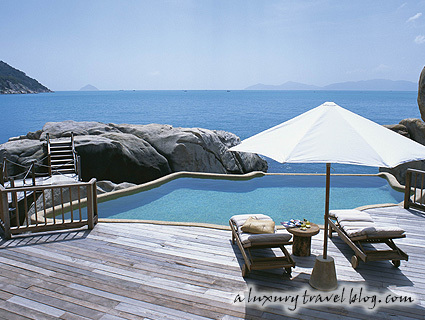 It’s now “Six Senses Hideaway Ninh Van Bay” (http://www.sixsenses.com/Six-Senses-Hideaway-Ninh-Van-Bay/index.php) . I’m always dreaming if one day I could be there. The view and the villas are too good to be true. 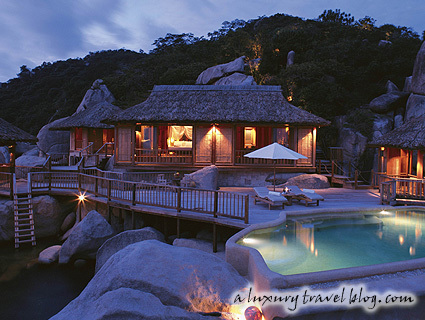 I’m also looking forward to ” Senses Hideaway Con Dao”in Vietnam (open late 2009) and of course, the Nam Hai (of GHM). 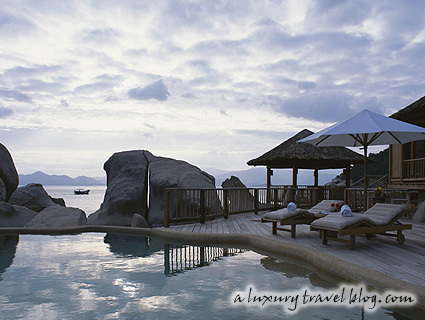 I went to Vietnam last year and stayed at Evason Ana Mandara & Six Senses Spa -Nha Trang. It’s an affordable resort with great views and unbelievable service. No wonder they have been awarded many “best of”. I also stayed at Ana Mandara Villas Dalat Resort & Spa (formerly Evason Ana Mandara Villas and Six Senses Spa Dalat ), another stunning villa resort. Of course, the world famous Sofitel Dalat Palace is still a unique lovely one. I had a great time in Vietnam. Hopefully I could visit there again and stay at different hotels. Absolutely beautiful !!! what was your opinion on Vietnam itself? although I am sure if I was staying here I would not be moving far, pure heaven!